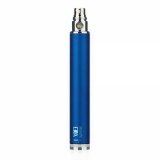 Vision Spinner eGo Variable Voltage 1300mAh Battery is the new vesion of spinner series battery. It is functionally the same with the old vision spinner batteries, but comes with new package, outlook and logo. Try the new product for your cartomizer. The battery allows you to adjust voltage output from 3.3v to 4.8v by spinning the knob at the bottom. 5-Click protection: Generally, the battery is shipped in the off position. In off position, it will not function even when pressing the button. To turn on battery, press manual button 5 times within 2 seconds. You will see white LED flash. To turn off battery, press manual button 5 times within 2 second as well, the white LED will flash! "5-click protection" can protect the battery from being activated when you do not want or do not use it. No more firing in your pocket! Cut off time: If the button is pressed for 10 seconds, the battery will shutoff until the button is released. How to adjust the output voltage Spin the knob in a clockwise direction to increase output voltage and spin the knob in anti-clockwise direction to decrease output voltage. High output voltage gives more vapor. 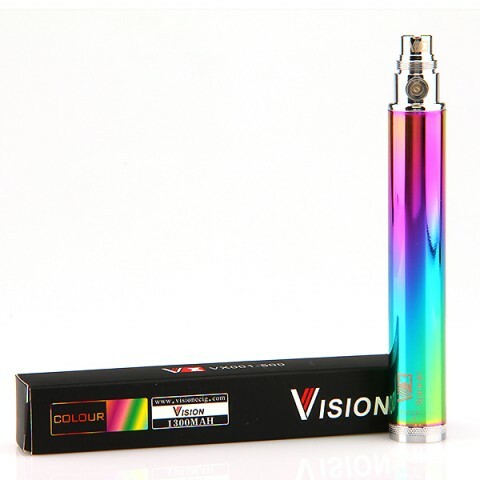 You can adjust the output voltage so easily and enjoy the whole vapor time. • It comes with ego thread, compatible with 510/ego thread cartomizers or chargers. • CHARGER NOT INCLUDED. It can be charged via Vision USB charger. • Using the battery at a higher voltage output will drain the battery faster than at a lower voltage. We suggest you to start with a low voltage and increase the voltage gradually until you find the right voltage for your atomizer/cartomizer. • There is CE mark on the battery body. Genuine vision spinner ego battery. Ordered serveral of these. Very cheap price here and good service. Will buy again. It's not easy to find these vision batteries now. I'm an old guy who is vaping lol. 1300mah battery lasts me a long time, and very easy to use. Simple and reliable. Needed to grab more. These ego batteries are my favorite. Vape pen is my style. These vision spinenr batteries are must have for me.